Today, if Rohde & Schwarz, Keysight, or some other major test equipment manufacturer announced during a trade show presentation a new oscilloscope model with a "Breakthrough!" featured dubbed "Cali-Brain®," they would be laughed off the stage. The technology truly was a breakthrough in terms of displaying peak-to-peak waveform measurements in a numerical presentation along with a cursor line indicating the pk-pk extent from the display. It was not as convenient as next-generation scopes that provided a movable horizontal pair of lines with a direct digital voltage difference readout, but it did take some of the guesswork and potential error out of readings on complicated waveforms. Of course modern microprocessor-based measurements and user interfaces take all the work out of making many sorts of measurements. B&K definitely deserves credit for its Breakthrough! feature. The new B & K Precision 1440 General Purpose Oscilloscope breaks through with laboratory performance at a Service Technician price. And it comes with an exclusive feature: the Cali-Brain system of measuring waveform voltages. 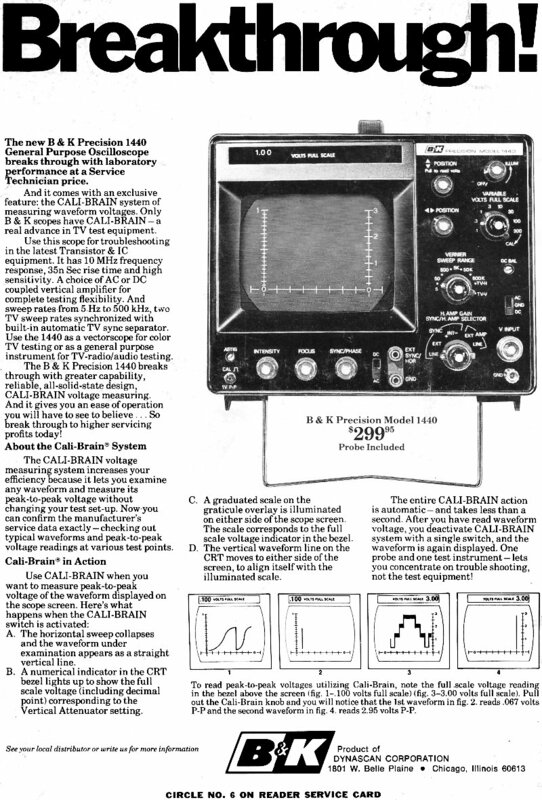 Only B & K scopes have Cali-Brain - a real advance in TV test equipment. Use this scope for troubleshooting in the latest Transistor & IC equipment. It has 10 MHz frequency response, 35 nSec rise time and high sensitivity. A choice of AC or DC coupled vertical amplifier for complete testing flexibility. And sweep rates - from 5 Hz. to 500 kHz, two TV sweep rates synchronized with built-in automatic TV sync separator. Use the 1440 as a vectorscope for color TV testing or as a general purpose instrument for TV-radio/audio testing. 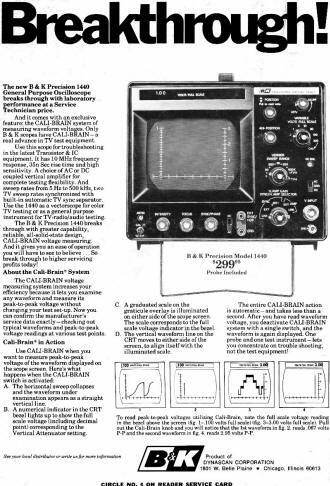 The B & K Precision 1440 breaks through with greater capability, reliable, all-solid-state design, Cali-Brain voltage measuring. And it gives you an ease of operation you will have to see to believe ... So break through to higher servicing profits today! The Cali-Brain voltage measuring system increases your efficiency because it lets you examine any waveform and measure its peak-to-peak voltage without changing your test set-up. Now you can confirm the manufacturer's service data exactly - checking out typical waveforms and peak-to-peak voltage readings at various test points. A. The horizontal sweep collapses and the waveform under examination appears as a straight vertical line. B. A numerical indicator in the CRT bezel lights up to show the full scale voltage (including decimal point) corresponding to the Vertical Attenuator setting. C. A graduated scale on the graticule overlay is illuminated on either side of the scope screen. The scale corresponds to the full scale voltage indicator in the bezel. D. The vertical waveform line on the CRT moves to either side of the screen, to align itself with the illuminated scale. The entire Cali-Brain action is automatic - and takes less than a second. After you have read waveform voltage, you deactivate Cali-Brain system with a single switch, and the waveform is again displayed. One probe and one test instrument - lets you concentrate on trouble shooting, not the test equipment! To read peak-to-peak voltages utilizing Cali-Brain, note the full-scale voltage reading in the bezel above the screen (fig. 1 - .100 volts full scale) (fig. 3 - 3.00 volts full scale). Pull out the Cali-Brain knob and you will notice that the 1st waveform in fig. 2. reads .067 volts P-P and the second waveform in fig. 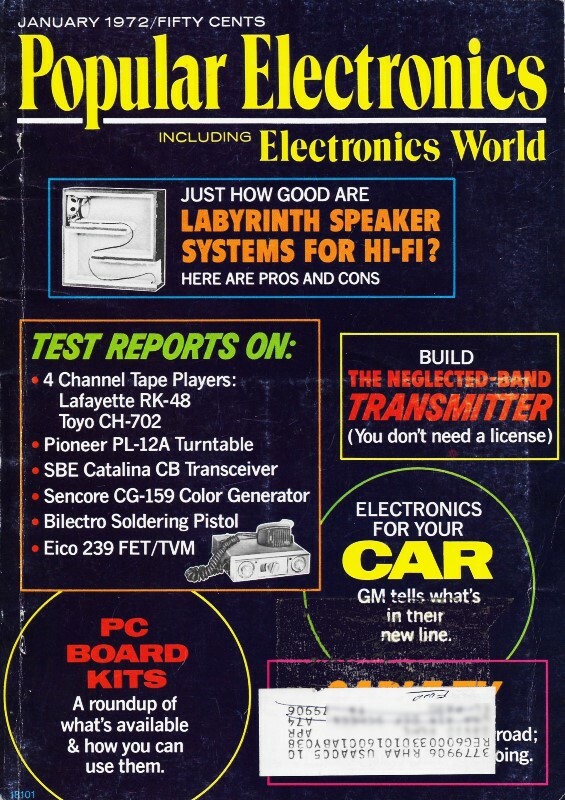 4. reads 2.95 volts P-P.